Save time and money with our pre-engineered and semi-custom loading rack systems for truck and rail. Portable loading racks give you the flexibility you need. Our modular approach to pipe rack systems means quicker install and less on-site fabrication costs. Keep the environment safe and lower cleanup costs with our bulk loading metal and polymer track pans. Our loading rack and pipe rack installation crews have decades of field experience, are nationally licensed general contractors, and have extensive fall protection systems training and OSHA 30 hour and OSHA 40 hour certifications. With decades of experience in access equipment and bulk transfer systems, and over 30,000 square feet of manufacturing space under crane, Modular Access Systems' proven expertise gives us the confidence that we can deliver your loading rack system project on time and under budget. Modular Access Systems, LLC services your unloading and loading rack needs, supplying the most cost effective fall protection for your loading racks. Experience has proven the best loading and unloading access equipment must provide fall protection. Fall protection means security for your personnel and a productive loading and unloading operation. 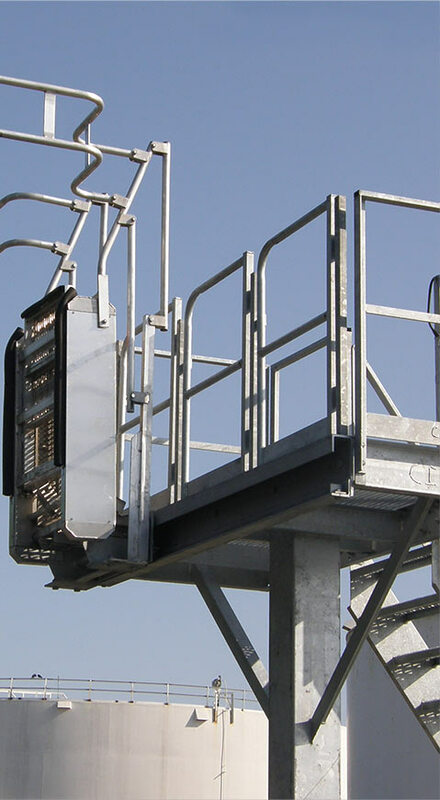 Engineered and manufactured for fall protection, designed for standard loading and unloading requirements, our platforms, loading racks, and gangways are manufactured with safety in mind. Modular Access Systems delivers your project on time and under budget! Our products are designed and manufactured with a modular approach which moves more of the welding and metal fabrication to our shop floor and away from your job site. This standardized approach greatly reduces your installation time and cost and improves product quality. Modular Access Systems’ manufacturer’s engineers have standardized our platforms, loading racks, safety bridges and gangways by surveying hundreds of unloading and loading racks and developing a common standard. Our engineers started with the standard heights of trucks and rail cars that our customers use and then integrated the OSHA guidelines for fall protection. Then we developed a product line of loading platforms, loading racks, bridges, and gangways that we pre-manufacture that meets this combined set of standards. Our standard loading platforms, loading racks, safety bridges and gangways are stocked and ready for shipping. All of our equipment comes with approval drawings as well as foundation designs for our standard unloading and loading racks. By using a standard pre-manufactured loading platform, loading rack, safety bridge or gangway, the time between order and delivery is greatly reduced and you get peace of mind by meeting OSHA guidelines for fall protection. Our job is to make you look good by delivering your loading platforms, loading racks, bridges and gangways on time and under budget.